Want to make something form pallet wood – anything from furniture to decor accents? 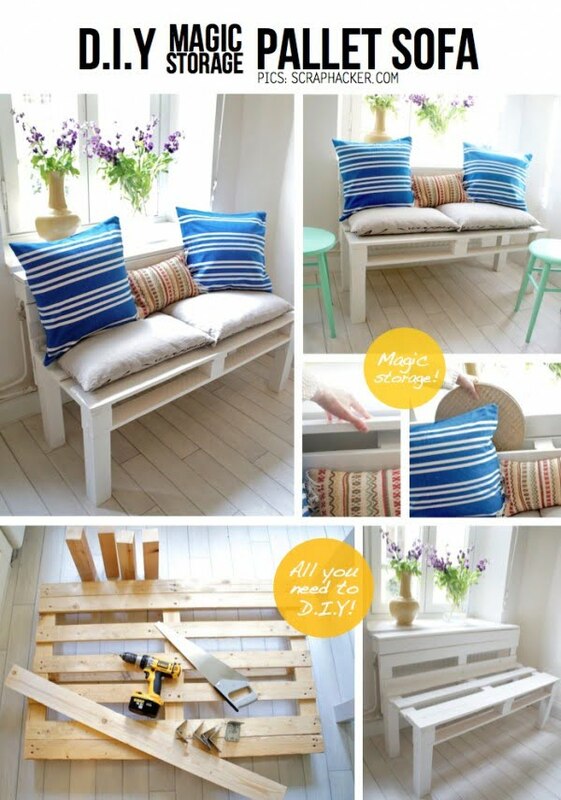 Here are 19 easy DIY pallet projects with instructions to help you out. Perhaps there’s no other material as versatile as pallet wood when it comes to DIY projects. After all, it is wood, and it is cheap. More often than not, pallet shape is the perfect base for a project (especially if it’s DIY furniture). 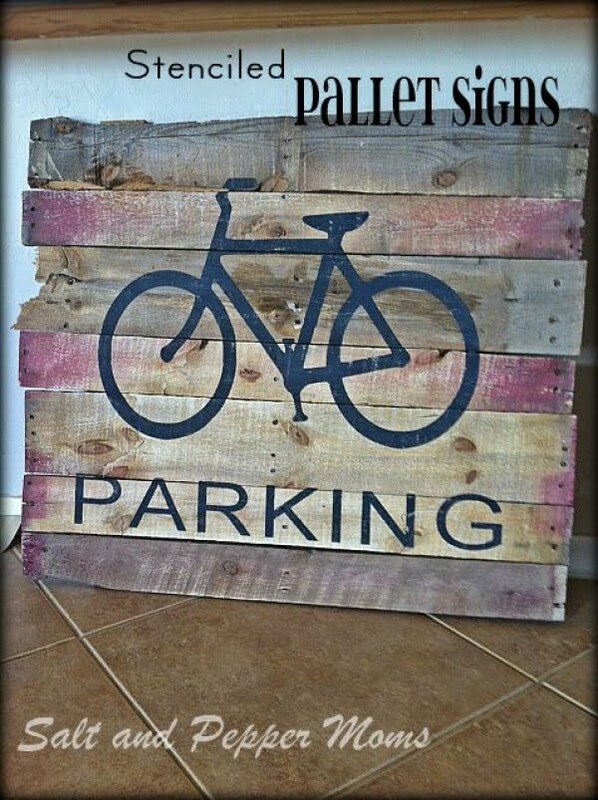 And besides, pallet projects are usually easy enough for beginners. That makes them very popular. All you have to do is to pick a tutorial with instructions for your project, and you can get it going. By their nature, these tutorial don’t take a lot of time too. Most of them you can do over a weekend. 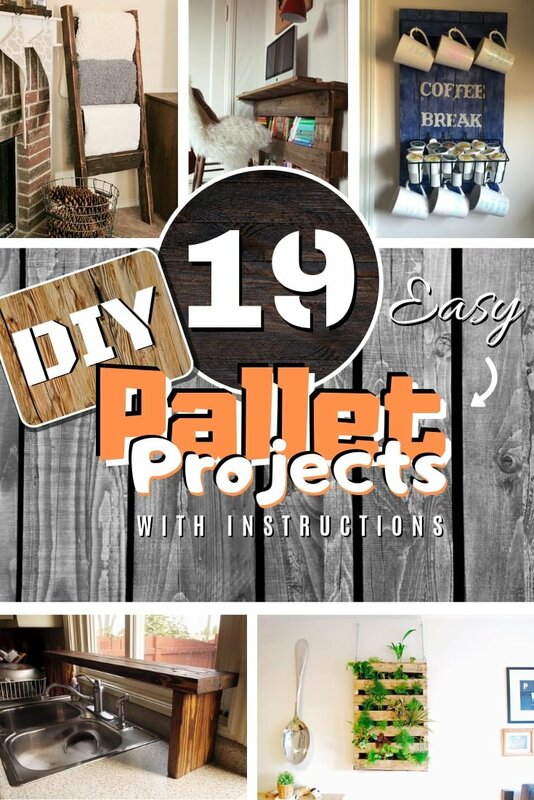 So check out these easy project ideas and get your pallets ready. When it comes to building your furniture, the idea can seem intimidating and complicated, to begin with. But if you keep things simple, as this tutorial shows, you can quickly build a small sofa from pallet wood. If a sofa is too complicated to begin your first pallet project, this blanket ladder is a piece of cake. Check out how to nail pallet wood together and get a trendy decor piece. If you like rustic decor, this piece of furniture is all about it. It’s simple to build, yet very functional – serving as a storage unit as well as a bench. It can find a home in your entryway or even bedroom at the end of the bed. Decorating empty wall space with pallet art of your own making is the dream of every crafty homeowner. And while there are many ways to build a picture frame, check out this very easy pallet plaque as an option to display pictures. 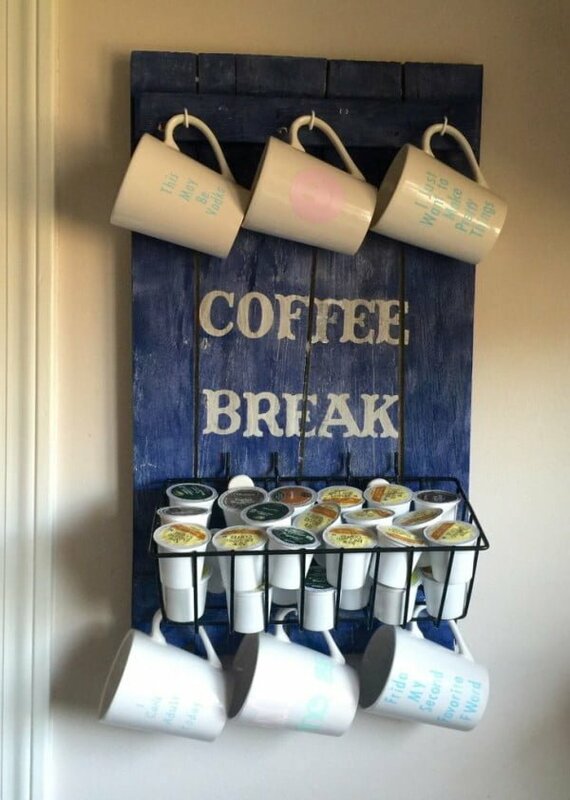 This mug rack is a whole coffee station with ample space to hang your cups as well as store your coffee condiments. It is quite an easy project to build on a carefree weekend. When it comes to simple ideas, this is as simple as it gets, but it is ingenious nonetheless. How do you get more storage space in the kitchen? 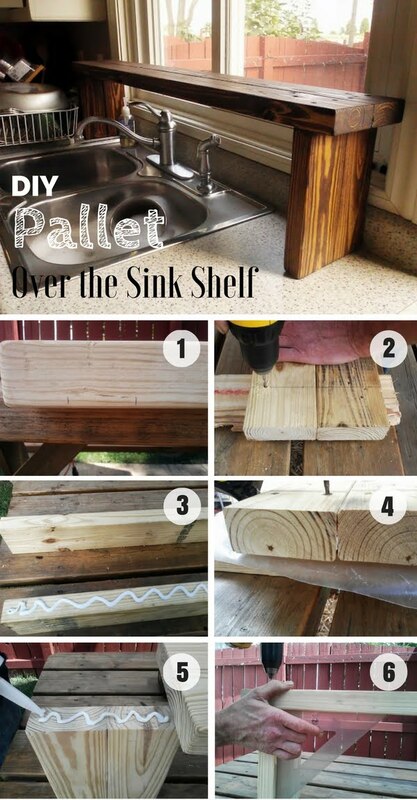 Simple – build an over the sink shelf from pallet wood. Once you finish a few smaller projects with pallet wood, try something more challenging, such as this bench. While it’s still not too complicated, you can get a piece of furniture which looks quite a high grade. Doesn’t this coat hanger look nice? The clean, rustic style is quite charming, and you can have it at your own home too. Follow the instructions closely. If your home office needs a makeover, but you can’t afford expensive furniture, build it yourself. After all, this pallet desk looks unique and charming with lots of character. This project may be the easiest on the list, but it’s also full of charm. If you want just a small accent of pallet wood in your decor, use this small board as a hanger for small items. 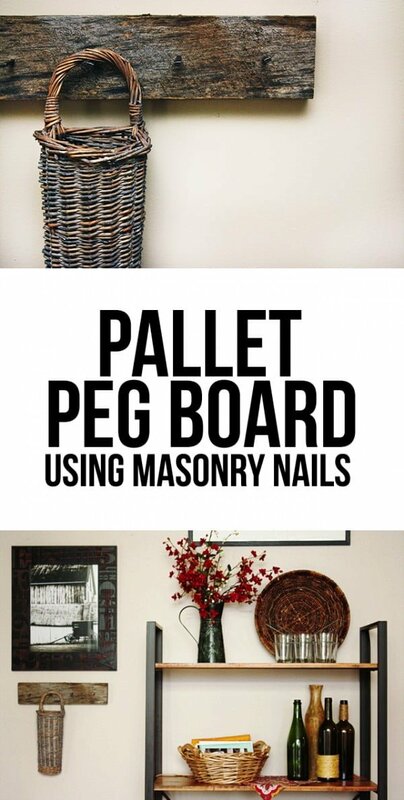 Masonry nails work great as hooks to complete the rustic look. Recently we’ve published a post about farmhouse signs, and pallet wood has made an often appearance there as the perfect material. Here’s another project to follow along that theme – stenciled pallet signs. As pallets bring a lot of character to home decor, it’s time to move it up a notch with whimsical accents. 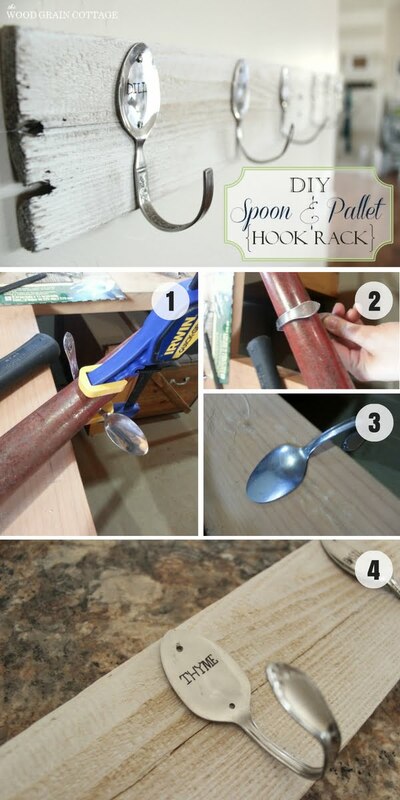 Use old spoons as hooks to get a unique coat rack that will become the focal point of your decor. While this shelf design is pretentious, it is quite an easy project. If you think your home decor can benefit from a display shelf like this, it will be a fun little project to build. We’ve seen these lovely DIY wine racks all over Pinterest for a long time, so it’s about time we’ve found instructions for one. 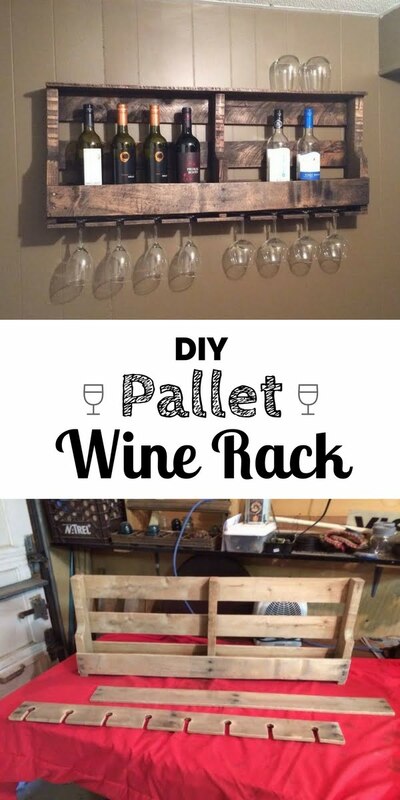 Here’s how to build your very own pallet wood wine rack. Finally, another coat rack design for your choice. This version is compact and comes with glove storage. It’s a cute option if you want something minimal and easier to build. Having houseplants or fresh herbs growing on a significant portion of a wall is quite a trendy new way to add greenery to your decor. It brings rustic home in a uniquely charming way, and it’s a great way to freshen up your surroundings. Check out the tutorial for instructions on how to build it. If you have toddlers in your family, this pallet bed is a great project to build something for them. The bed is quite easy to make from the wood of just two pallets. Your kids will love the warm rustic theme in their room as well. Follow the tutorial for easy instructions. Vertical window blinds made from pallet wood is a great rustic decor accent as well as a terrific way to give yourself more privacy from the outside. The project is relatively easy to complete, and there’s a detailed tutorial for you to follow. 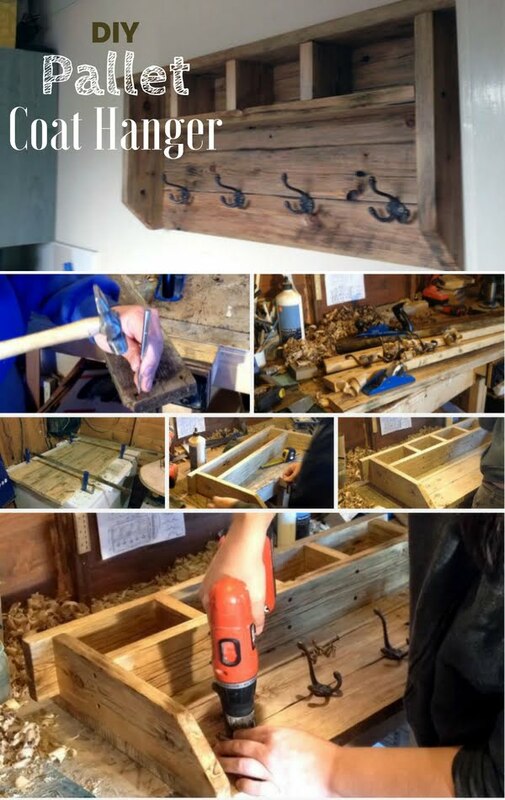 All you need is a couple of pallet wood planks and some nautical hooks to create this rustic wall rack. You can use the hooks of any other style as well, but the key is maintaining that rustic look for the best home decor benefit. Check out the tutorial to see this project in more detail.